I think it’s common problem as Active Directory gets bigger in organizations, control over content of that mission-critical component seems to be lost. Same happened in my place. In addition to that we had to provide information from AD on a regular basis in a form of report. We had no tools to pull all data from AD, process it and present in some readable format. However, I was working with skilled SQL guy who was also very good in Reporting Services. So, I proposed that we can link Active Directory with SQL Server and use Transact-SQL to pull information from AD, process it on SQL and then make it readable and presentable through Reporting Services. That would allow SQL guy to process all information and do all kind of reporting required. 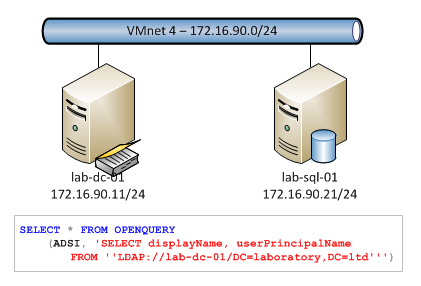 And below steps how we made SQL Server 2008 R2 to work with Active Directory to use Transact-SQL queries to pull information from directory database.